​​​MIDLAND - Downtown Midland has a new look as EnLink Midstream Partners makes its Permian Basin presence known. 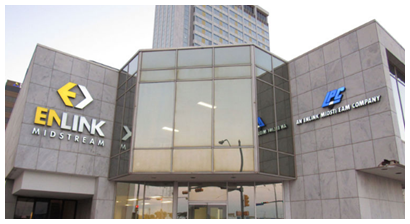 The EnLink logo is now displayed on the exterior of the west wing of the Bank of America Tower at 303 W. Wall St., where the Dallas-based company occupies approximately 56,000 sf on two floors. EnLink’s new regional office is designed to underscore the company’s commitment to Midland, Odessa, and the Permian Basin, where it employs 250 people.